To the Victor Go the Spoils (and the Calzones)! Samir Dahman, Partner in Charge of KJK’s Columbus office, and his client are savoring a recent victory in a bitter intellectual property dispute between a franchisor and former franchisee who both serve calzones. The franchisor – D.P. 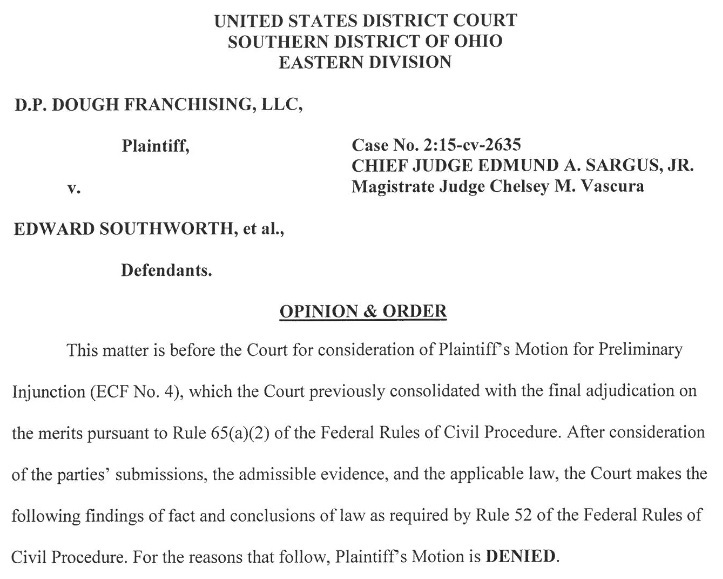 Dough – asserted nine (9) claims, including: trademark, trade dress, and copyright infringement; breach of contract; misappropriation of trade secrets; Ohio Deceptive Trade Practices Act, unfair competition, tortious interference with business, and unjust enrichment – against the former franchisee who went out on his own to open calzone restaurants in Southeastern college towns. Most concerning, however, was the franchisor’s motion for an injunction that would have required the former franchisee and Mr. Dahman’s client to close his two operating restaurants. But instead going through discovery and allowing the case to play out normally, D.P. Dough asked the U.S. District Court for the Southern District of Ohio to hold an immediate hearing on an injunction to force Mr. Dahman’s client to close his two restaurants. At the injunction hearing, which was converted to a trial under Rule 65(a)(2), Mr. Dahman debunked all of D.P. Dough’s claims, even though D.P. Dough was represented by the venerable attorneys of the Taft firm. D.P. Dough was so concerned that they would lose the injunction, and effectively the case, that it asked Mr. Dahman’s client if it would like to mediate. So the parties attended mediation and thought they may have reached a settlement. As it were, negotiations fell apart and the parties sought the Court’s guidance on the purported settlement. Eventually, the Court held there was no settlement and allowed the injunction to be decided. With the settlement snafu over, the parties anxiously awaited the Court’s decision that would end the whole case – and possibly Mr. Dahman’s client’s successful fledgling restaurants. Just as college students were getting settled back into their classes, Chief Judge Edmund A. Sargus, Jr. issued the Court’s decision finding that D.P. Dough likely could not succeed on the merits of its claims, and even if it could there was no irreparable harm to the business, while Mr. Dahman’s client’s businesses would be forced to shut down. In doing so, the Court found in Mr. Dahman’s client’s favor on all nine of D.P. Dough’s claims. The decision is reported at D.P. Dough Franchising, LLC v. Southworth et al., No. 2:15-cv-2635, 2017 U.S. Dist. LEXIS 157951 (S.D. Ohio Sep. 26, 2017). If you need a skilled and passionate advocate, contact Mr. Dahman at sdahman@dahmanlaw.com or 614.636.1250.